Soul Care’s counselors and staff can spend time in silence and solitude guarding and preparing our hearts as they care for others. Those coming for counseling and spiritual direction sessions at Soul Care have the opportunity to come early and prepare their hearts and/or stay afterwards to reflect further with the Spirit on what is then often closer to the surface of their heart and mind. Anyone from the public can use it. As Soul Care's staff schedules allow, we will increase the number of hours the Prayer Room is available and invite individuals, churches and ministries in the area to make use of it as well. I remember in the mid-90's there were a few beautiful old churches right in the frenetic center of Washington, DC where I'd occasionally go between work appointments and seek to hear from and experience God through Scripture, prayer and journaling. This was during the most painful time in my life so far, a time when I felt very distant from and abandoned by God. But the Holy Spirit graciously used even the unique character of those old sanctuaries – beautiful spaces dedicated for the purpose of meeting with God – to facilitate times that started growing seeds of trust and gave me tastes of His actual closeness and love. 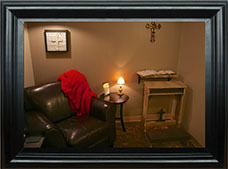 All of Soul Care's counselors and staff hope that God will use the Prayer Room in similar ways in your heart. Might He be inviting you to meet Him there? In the calendar below you can see the Prayer Room's available times & dates and make 30, 60 or 90 minute reservations. Single or recurring reservations can be made up to 3 months in advance. 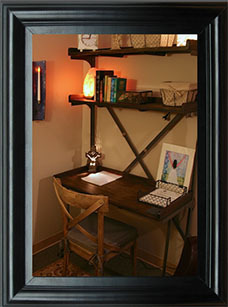 Once you make a reservation you will receive a confirmation email along with instructions for using the Prayer Room. PLEASE thoughtfully steward this resource God has provided and cancel as far in advance as possible any reservations you have made but won't be able to use so that the Prayer Room doesn't needlessly go unused by others at those times. Note: The Prayer Room calendar below is embedded in Soul Care's website from a separate calendaring utility. You will need to create a simple profile and be logged in to make or change reservations. When you are logged in to the calendar, your name and mobile number will be visible to you but they will never be visible to anyone else, nor will anyone else's name or mobile number ever be visible to you. Beware in your prayer, above everything, of limiting God — not only by unbelief, but by fancying that you know what he can do.